Notice: This page contains affiliate links and LAtourist will be compensated if you purchase attraction tickets by clicking on the following links. Universal Studios Hollywood - The world-famous movie studio and theme park featuring movie studios, tours, attractions, rides, restaurants and more. The movie studio tour offers a behind-the-scenes look at special effects and movie-making techniques. The rides and attractions are based on major movies that have been produced by Universal Studios. Immerse yourself in the adventures of Harry Potter™ at The Wizarding World of Harry Potter™; Enter the world of The Simpsons™ like never before and visit downtown Springfield and hold on tight for the all-new grand finale, Fast and Furious-Supercharged. Los Angeles Zoo - animals, reptiles and birds in their natural habitat. The Zoo costs less than a movie but offers far more entertainment value. Our zoo is smaller than the San Diego Zoo although it's much closer and the admission cost is much lower. 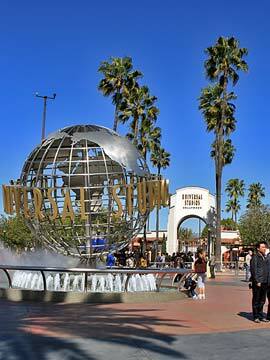 It's in Griffith Park, north of downtown Los Angeles, in the general area of Universal Studios. 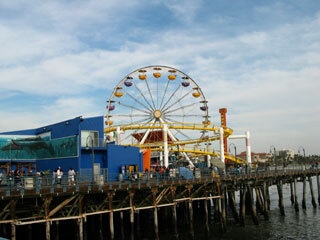 Pacific Park, Santa Monica - a carnival style amusement park located on the Santa Monica Pier. A Ferris wheel offers spectacular views of the Santa Monica Bay, the Pacific ocean, Santa Monica, Ocean Park and Venice Beach. There are carnival games, a roller coaster and other rides. The Go Los Angeles card (buy online) includes Pacific Park. Sherman Oaks Castle Park - Miniature golf (three 9-hole courses), indoor arcade with video games, air hockey and other games, laser tag, batting cage with multiple skills, and a snack bar. Parking is free. This venue is maintained by the L.A. Park system [San Fernando Valley]. Giant Sportz Paintball Parks - three paintball and airsoft parks in the L.A. area, plus one near San Diego. The parks are SC Village located in Chino (east of downtown L.A.), Hollywood Sports in Bellflower (near Long Beach), and California Paintball and Airsoft Park in Castaic (near Magic Mountain). Magic Mountain - If you like roller coasters, then you'll LOVE Magic Mountain. The emphasis is on thrill rides, and some of them are heart-pounders! The park also offers theme attractions, carnival games, arcades, food, shows and more opportunities for an entire day of thrills and fun. [Santa Clarita, Northern L.A. County]. Hurricane Harbor - From thrilling speed slides to cool kids' areas to gallons of water adventures, Six Flags Hurricane Harbor is a tropical paradise and the perfect place to cool off and work on your California tan. [Santa Clarita, Northern L.A. County, very close to Magic Mountain]. K1 Speed Torrance - An indoor go cart race track in the Torrance/Gardena area. Experience the thrill of 20hp electric karts at an affordable price. Open late on Fridays and Saturdays. Also ideal for parties and meetings. Castle Park (Riverside) - located near the 91 freeway in Riverside, this amusement park offers 27 rides suitable for all ages, four championship miniature golf courses, a vast selection of carnival midway games, a water playground, retail shops, a video arcade, and more. Escape Room Games - You and a group of others are given the challenge of finding a hidden exit within an allotted amount of time. Some escape games employ scare tactics, but most simply involve solving puzzles and deciphering clues to find the way out of the room. Most are open to younger participants so the whole family can join in. 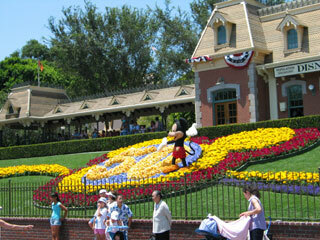 Disneyland - Southern California's most popular amusement park. Emphasis on theme attractions and rides. Disneyland is a "must see" attraction. You will feel the magic of Disneyland as soon as you enter the park! Plan on spending a whole day (or longer, if possible). Follow the link to find more info and a Disneyland Photo Gallery. Disney's California Adventure - Disneyland's sister park is located near the main gate of Disneyland. Come celebrate the fun and adventures of California -- Disney style! You'll be immersed in the California spirit through the magic of Hollywood, the thrills of a beachfront boardwalk and the adventures of the great outdoors. You can visit California Adventure in one day or less, so a 2-day Park Hopper lets you enjoy both parks and gives you extra time to explore Dsineyland. 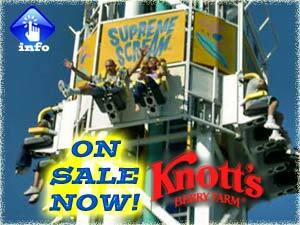 Knott's Berry Farm - Large theme park with an emphasis on theme attractions and rides. There is an adjacent shopping district that you can visit for free. Some thrill rides. 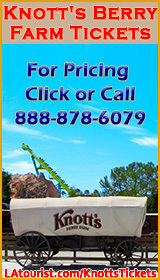 If you like slower rides where you can look at animated characters and other scenarios, try Knott's. This is a good place for kids. The park and the shopping district follow an old western (cowboy) theme, plus features Snoopy and other Peanuts characters. Soak City - Located next to Knott's Berry Farm theme park, Soak City is one of Southern California's largest water parks. High-speed slides, 4-person rafts, single-rider inner tube slides, enclosed slide flumes, a lazy river, wave pool, and a family fun house featuring a variety of water activities. Adventure City - a small amusement park that offers rides and activities for kids, for a low admission fee. The park is located in Anaheim, about 5 miles west of Disneyland, and 3 miles south from Knott's Berry Farm. Open weekends and holidays. Speedzone - a park built around speed and competition, incorporates real racing action, indoor interactive entertainment and great food to create a one-of-a-kind entertainment experience. Situated on approximately 12 acres of land. Pilot a NHRA Top Fuel Dragster, spin wildly in a go-kart on the finely polished concrete surface Slick Track, race Grand Prix cars and more. LegoLand California - Near San Diego. The theme park features rides, entertainment and more than 15,000 models and attractions made out of tens of millions of Lego bricks, including a dinosaur that is alone built from more than two million bricks. Young kids LOVE LegoLand! They'll find rides and roller coasters made especially for them! Older kids and parents will enjoy the laser blasters and the Lego Mindstorms Learning Center. LegoLand is about a one-hour drive south from Disneyland but it is definitely worth the drive. This attraction is sure to provide your family with a full day of thrills and entertainment. San Diego Zoo Safari Park - (formerly called Wild Animal Park) - Located 32 miles northeast of the San Diego Zoo near the city of Escondido in north San Diego County, the San Diego Zoo Safari Park is 20 times larger than the Zoo. It is also a completely different experience than a visit to the Zoo. The 1,800-acre wildlife preserve allows visitors to view herds of exotic animals as they might have been seen in their native Asia and Africa. The Park has over 3,500 animals representing 260 species, and is also an accredited botanical garden. Optional - you can feed and photograph animals up close with the Safari Park Adventure Photo Caravan add-on (see ticket pricking below). San Diego Zoo - The San Diego Zoo cares for more than 4,000 individual animals representing 800 different species. Its collection of animals, as well as its plant collection of over 6,500 species, is acknowledged as one of the finest in the entire world. 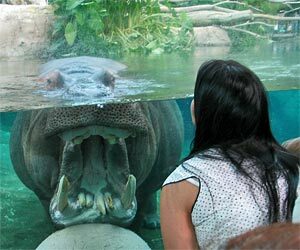 TIP: For a memorable experience at the San Diego Zoo, try the optional "Backstage Pass" experience. You'll be treated like a VIP as you are personally introduced to furry, feathered, and scaly critter celebrities in a private show area! SeaWorld San Diego - SeaWorld is about a two hour drive south of downtown Los Angeles. See dolphins, polar bears, whales, sharks and other aquatic animals in exhibits and performances. Belmont Park - San Diego's only beachfront amusement center and home of the historic Giant Dipper Roller Coaster and Plunge. Belmont Park carries on the tradition of old-time family fun featuring The Giant Dipper Roller Coaster, Vertical Plunge, Bumper Mania, Tilt-A-Whirl, Liberty Carousel, Crazy Submarine, Thunder Boats, Baja Buggies, Sea Serpent, and Pirates Cove, San Diego's largest and most adventurous indoor children's play center.